The winter season has arrived, when all the skiers start practicing their skiing squat position and snow boarders their 180’s in preparation for fun times on the slopes. A story I often chuckle about occurred 10 years ago when my brother-in-law persuaded me to try snowboarding on the Andorra slopes on some compacted ice, due to little snow fall! On descending a red run, my brother-in-law halted proceedings half way down the slope, to state “watch this Liffy”, only for him to not quite make a flamboyant 180 degree turn, and landing flat on his back sliding down the slope, which resulted in a few days in bed – a self-inflicted injury! Another injury sometimes caused on the slopes is Skiers Thumb (ST). 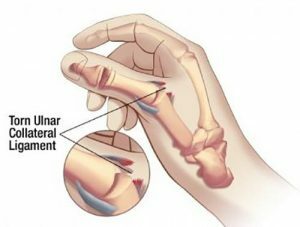 ST is a painful injury to the thumb ulnar collateral ligament (UCL) caused by landing on your hand whilst holding onto a ski pole. In a recent study, 49% of UCL disruptions of the thumb were caused by a fall onto an outstretched hand (FOOSH). Sports injuries accounted for most of the remaining injuries, with only 2.4% acquired as a result of skiing injuries, however anybody can sustain a ST injury from a FOOSH! Commonly, ST is sometimes described as Gamekeeper’s thumb (GT), both of which involve insufficiency of the UCL of the thumb. The UCL may have partial or complete tear (see Figure 1), or in some cases have an avulsion fracture (where the ligament remains intact but pulls a small fragment of bone away from its attachment site). The main difference between ST and GT, is that ST is generally considered to be an acute condition acquired after a FOOSH or similar abduction injury to the metacarpophalangeal (MCP) joint of the thumb. In comparison to GT, this typically refers to a chronic condition, which has developed as a hyper-abduction of the thumb MCP joint as a result of repetitive strain over a long period of time. Generally, signs and symptoms of ST and GT include instability of the thumb MCP, accompanied by pain, weakness on pinching/gripping and swelling. Other complaints include intense pain experienced upon catching or jarring the thumb, for example, on a coat pocket. In most cases, treatment of ST and GT includes conservative management with physiotherapy, except in the cases with a traumatic onset and a complete UCL tear, likely due to FOOSH. In these cases surgery maybe indicated to repair the UCL. An xray and/or ultrasound investigation maybe clinically indicated. Ultrasound is very useful to assess the integrity of the ligament, comparing it the non-injured side (Figure 2) and stress-testing the UCL during dynamic scanning. If you would like further information on your injury please contact ECP direct. Take care on the slopes and be careful of the 180’s! Figure 1. Complete tear of the UCL. Figure 2. Partial tear of the UCL as demonstrated on ultrasound.